As a lawyer working with people who had sustained terrible and often lifelong injuries in road crashes, Michael identified the need for people to be emotionally supported in their journeys of grief and trauma. During his involvement with, and participation in the initial committee which was to become Road Trauma Support Team, he offered his expertise in law to assist the program in its early incarnation. Hence the Befriender Program, and ultimately Road Trauma Support Services Victoria (RTSSV) was born. He dedicated the following decade to the fledgling committee and organization, ensuring its financial survival. Of particular note was his participation in the Rose Weekend, a fundraising initiative that was instrumental in the early successes of the organisation. Later his astute business acumen and savvy professional connections were once again instrumental in creating a philosophically aligned relationship with the Transport Accident Commission, a relationship that continues 19 years after inception. His support of our work has, as recently as this year, continued to provide opportunities for us, ultimately for the benefit of Victorians impacted by road trauma. 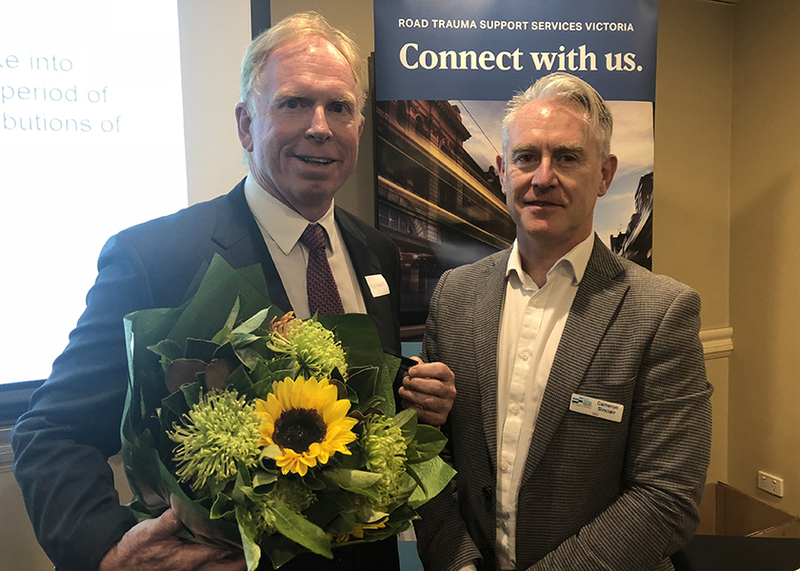 And so, after 24 years of friendship, support, guidance and dogged determination, it is our privilege and pleasure to admit Michael Lombard (pictured below with CEO, Cameron Sinclair) to Honorary Life Membership with RTSSV.